CNBC is the business news station that I tend to watch during the trading day, and they spent quite a bit of time examining the marijuana and cannabis sector this last week. After the remarks made by U.S. Attorney General Jeff Sessions, they provided increased coverage, focusing on stocks reacting negatively to the news release. I produced this SA Instablog with links and names for a list of State Attorneys General in U.S. states where recreational marijuana has already been decriminalized. I do not repeat this list or these links in this article, but you can use the hyperlink to examine them and draw your own conclusions. I am not concerned and do not believe that any of these states will use the Jeff Sessions remarks to alter existing, decriminalized policies in their states. The comment from this last week is far less aggressive (see above). There is a big difference between “White House may boost…enforcement” (February 2017) and “let state attorneys decide” (January 2018). They are respecting state rights, which is a theme Trump touted during the presidential election. Therefore, I view the most recent statement as FAVORABLE for the marijuana or cannabis sector. 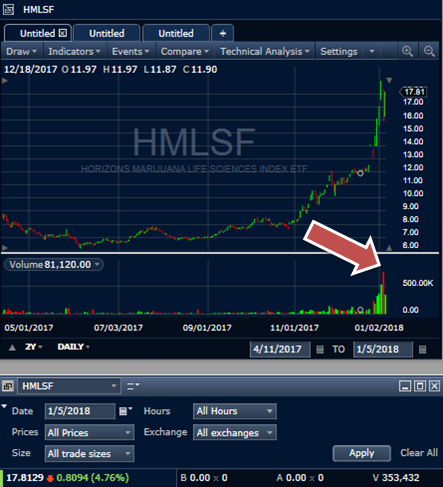 Note the detectable impact that the Jeff Sessions statement had on the Horizons Marijuana Life Sciences Index ETF (HMLSF) (see red arrow and red volume indicator in the below chart). 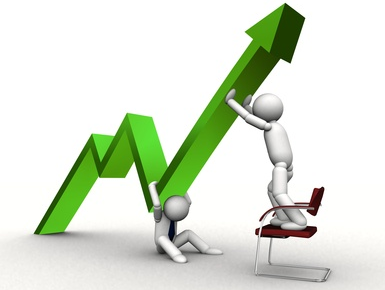 Note that a recovery is already in progress (see green volume indicator in the above chart). First, I should thank my followers for recommending additions to my portfolio. I hope I caught all of them in the comments section of my last Seeking Alpha article, but, if not, let me know if others should be added. 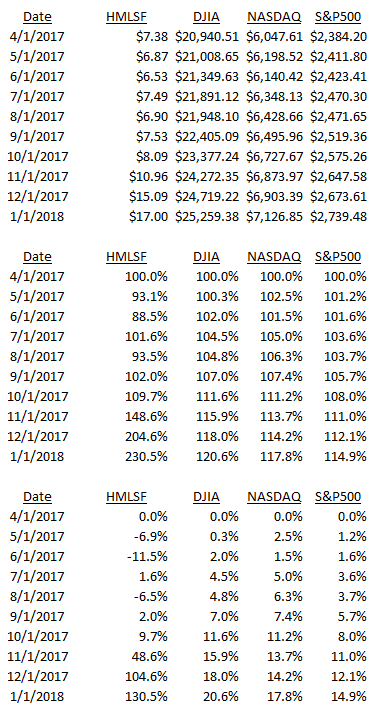 My methodology for the portfolio is in APPENDIX A.
I computed the Horizons Marijuana Life Sciences Index ETF (N=28) on equal-weighted [EW] portfolio basis at 4.12% for January 5. It is, of course, a value-weighted index, and actually rose 4.76% for January 5. 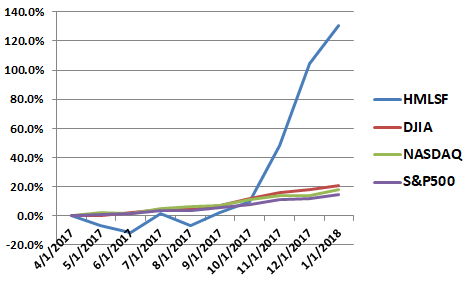 I separately computed ETF and non-ETF returns for the first week of January 2018 (see APPENDIX C). 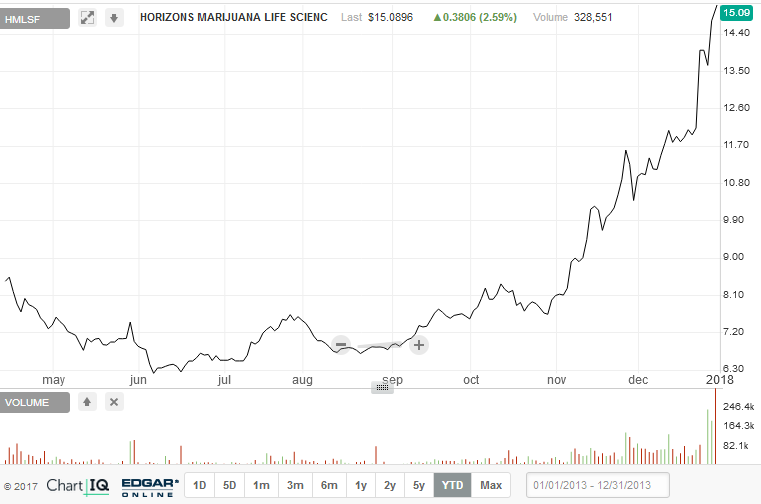 Below is a comparison of  the Horizons Marijuana Life Sciences Index ETF [HMLSF] to  the Dow Jones Industrial Average [DJIA],  the NASDAQ, and  the S&P500. I use monthly measures beginning on April 1, 2017, which is when the ETF began trading on the Grey market. The data I used to create this chart in contained in APPENDIX B.
I use Fidelity to trade this ETF. I, also, have a TD Ameritrade account, but do not use that account to trade this ETF. Some are having trouble trading this ETF through their broker. I maintain 2 separate brokerage accounts to avoid these issues, as I have had problems of this sort, in the past, with other stocks and it has cost me money in lost profits. 3. still dabble with a few dollars in marijuana and cannabis stocks and others that overreact, just as the Horizons Marijuana life Sciences Index ETF and other selected marijuana and cannabis stocks overreacted to the downside this last week with remarks made by Jeff Sessions. In brief, I am feeling pretty warm and fuzzy these days, and hope you are, as well, as we all consider options and alternatives for long-term, profitable investments. Alternative 1 is to maximize the population or universe of marijuana or cannabis stocks in my equal-weighted index or portfolio. This is the alternative I have selected. When a Seeking Alpha comment recommends that I add a stock to the population I  investigate support in the form of a press release or news item,  include the stock and ticker if there is evidence to support inclusion, and  never remove the stock or ticker from the population. 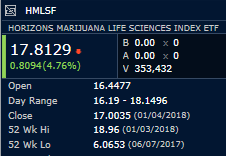 Alternative 2 is Alternative 1, but I could delete stocks and tickers when I determine that the firm is not really in the marijuana or cannabis sector. I do not do this. In order to do this, I would have to develop an algorithm and this would please no one. It would introduce subjectivity and bias. I prefer a slight error term to the alternative of subjectivity and bias. I suspect most social scientists would agree, but if someone disagrees, they can copy\paste the list I provide into an Excel file and use their own algorithm to delete stocks or tickers. 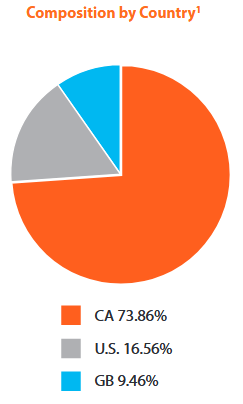 Alternative 3 is to focus only on the big caps or Canadian stocks or narrow my focus in some other fashion. Others are doing this, so I am providing for an alternative to perspectives already available in the market. 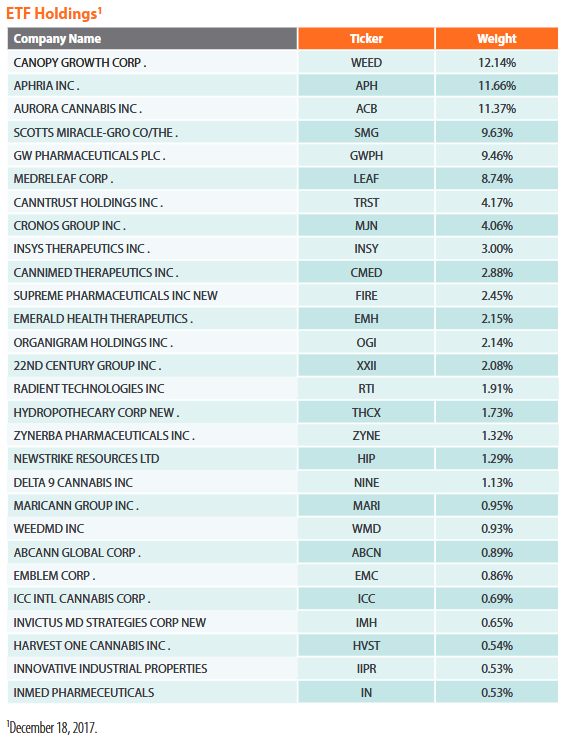 NOTE: The concern expressed by one person commenting was that I included some stocks and tickers that might have been involved in a past pump and dump scheme and were not really in the marijuana or cannabis sector. This is a legitimate concern, but, as addressed in Alternative 2, above, I will let the reader decide which to eliminate. I can say with near certainty that were I to use such a methodological approach in an article submitted to an academic journal, all reviewers and the editor would reject the article and or introduce bias with respect to their own, personal preference for the “correct” methodology for stock or ticker symbol elimination to be used. And given an infinite number of algorithms, none would agree. Electronic Cigarettes International Group, Inc.
GT Biopharma, Inc./Oxis International, Inc.